With its large population, growing middle class and increasingly modern spending habits Indonesia's retail sector is one of the most promising in Asia. Indonesia's retail sector remains one of the most promising in Asia. It has a large population and growing middle class, with rising household purchasing power and increasingly modern spending habits. Private consumption is forecast to remain robust in 2019 and 2020, increasing about 5% annually. 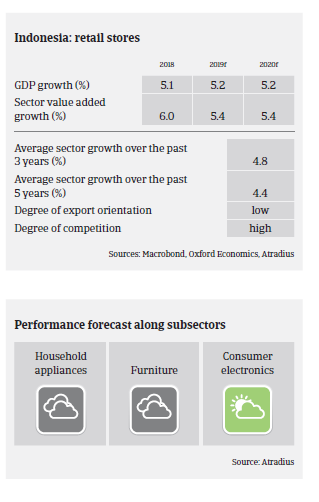 Consumer electronics sales are the main driver of sector growth. In comparison, growth in furniture and larger household appliances sales is lower, as the focus of general consumer spending is still more on essential items in Indonesia. Sales of clothing, a key growth driver for retail, grew by more than 10% in 2018. However, competition between the different brands is very high and the market tends to be price sensitive. Several uncompetitive department stores and clothing brands closed in 2018. In 2018, a number of retailers, both foreign and local, closed some or all of their stores in Indonesia as they were no longer able to sustain business amid weaker consumption and stronger competition. However, at the same time other retailers have increased capital expenditure by opening new locations, primarily to reach less saturated smaller cities and regions outside of Java. Those expansion plans piggyback on the government's undertaking for infrastructure and logistics development in more remote regions. E-commerce provides lucrative businesses opportunities for retailers across all subsectors, as Indonesia’s e-commerce industry is the fastest growing in Southeast Asia. There are several unicorn start-ups (privately held start-up companies valued at over USD 1 billion) like Tokopedia and Bukalapak, which have received funding from both foreign and local private equities. International players like Shopee (by Sea Limited) and Lazada (by Alibaba) are also active in the market. Profit margins of consumer durables retailers are expected to remain stable in 2019. The average payment duration in the industry is 40 days. The number of protracted defaults remains low, and our portfolio payment experience has been good over the past two years. We expect the level of non-payment and insolvencies to remain stable in the coming months. The overall indebtedness of businesses in the sector is low, and banks are generally willing to lend. Our underwriting stance for the industry is generally open to neutral. However, we assess buyers more prudently if there is a lack of financial and other qualitative information, such as strong group backing.